There is water and vegetation everywhere the eye can see. 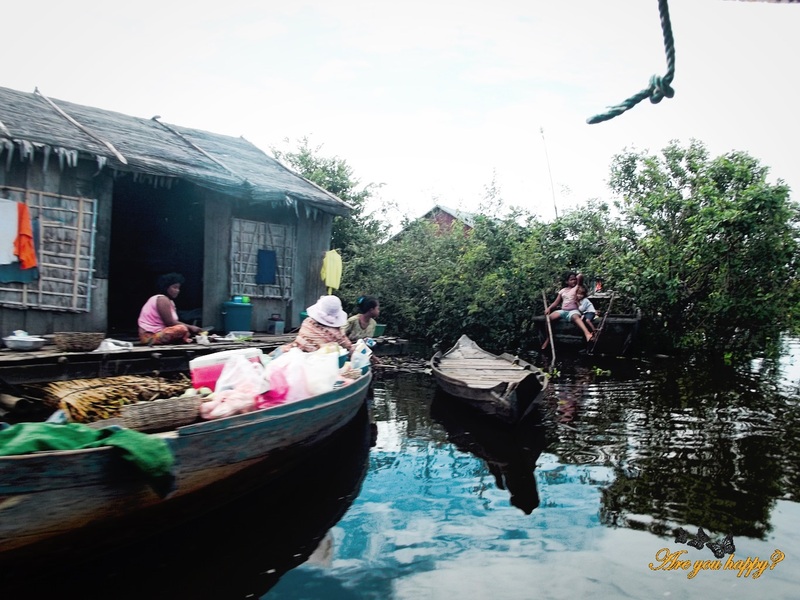 The boat moves further and further into the heart of Tonlé Sap Lake towards the floating villages carrying with it our curiosity for life on water and flashbacks of the troubled Vietnamese and Cambodian history. 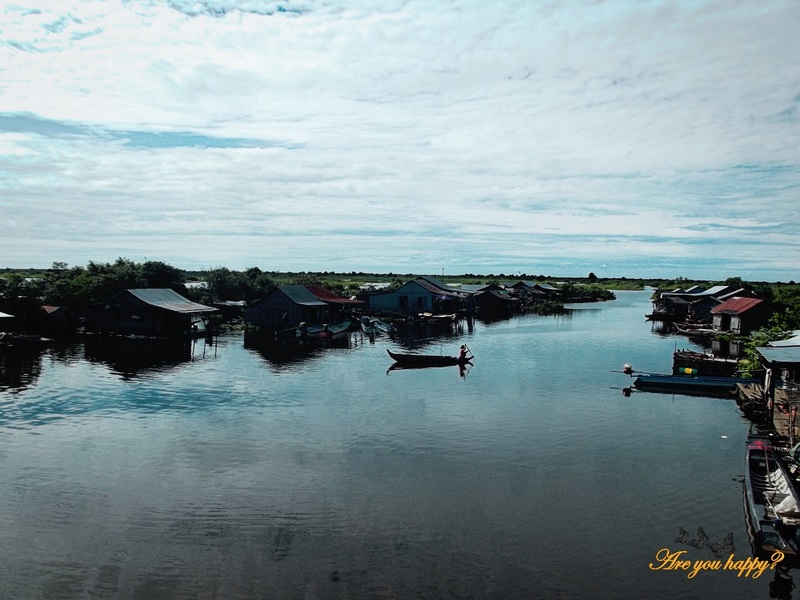 Tonlé Sap lake is definitely special; it is not only the largest fresh water in South East Asia with a flow changing its direction twice a year but is also home to many ethnic Vietnamese and Cham communities living in floating villages around the lake. More than 3 million people live around the bank of the lake 90% of which earn their living through fish catching and agriculture. The village we are in is home to 1,280 people most of which live under the poverty limit. The floating houses are small usually with one or two rooms. Three rooms are an exception. 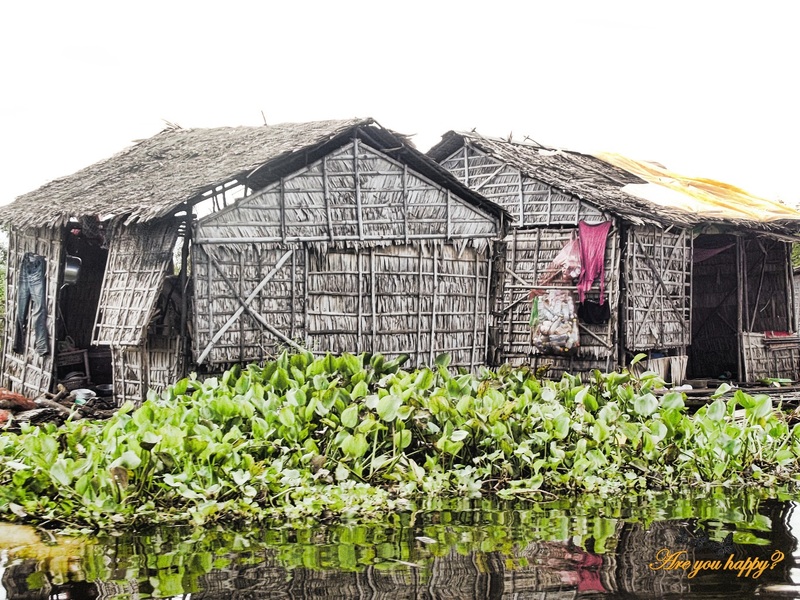 Bamboo pillars support the floating houses and make it easy for the house to be moved from one area to another during the rainy season. 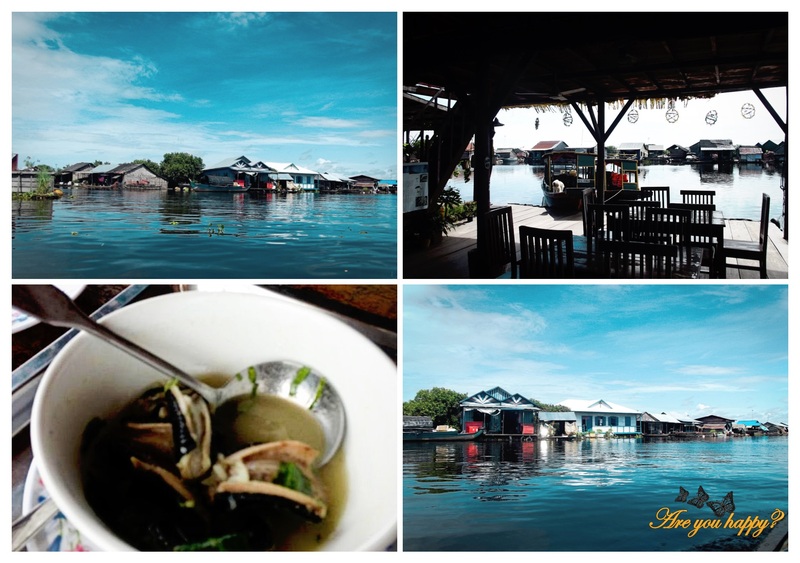 There is a sense of community in the floating villages. 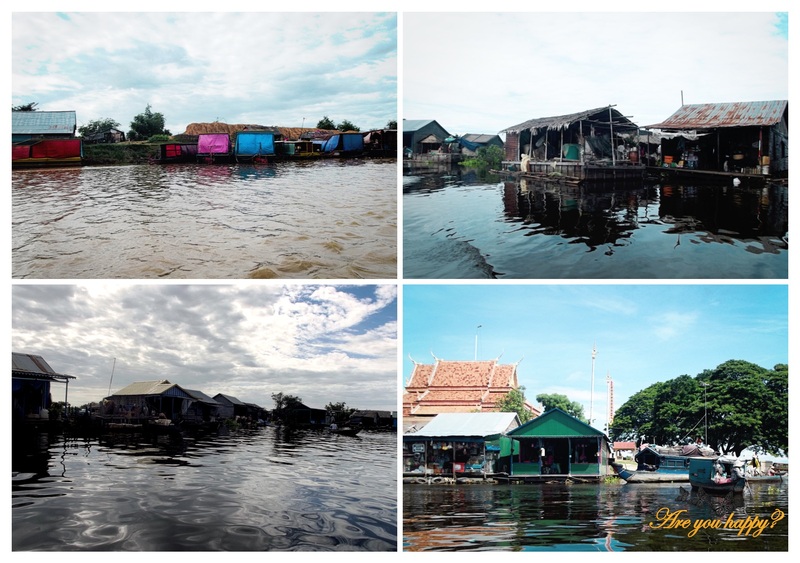 You can find the usual Asian floating markets with boats going from one house to the other carrying all types of supplies for the people in the floating houses, small floating shops, floating Catholic church, floating school and some bigger platforms with serving tables and snacks for the tourists. 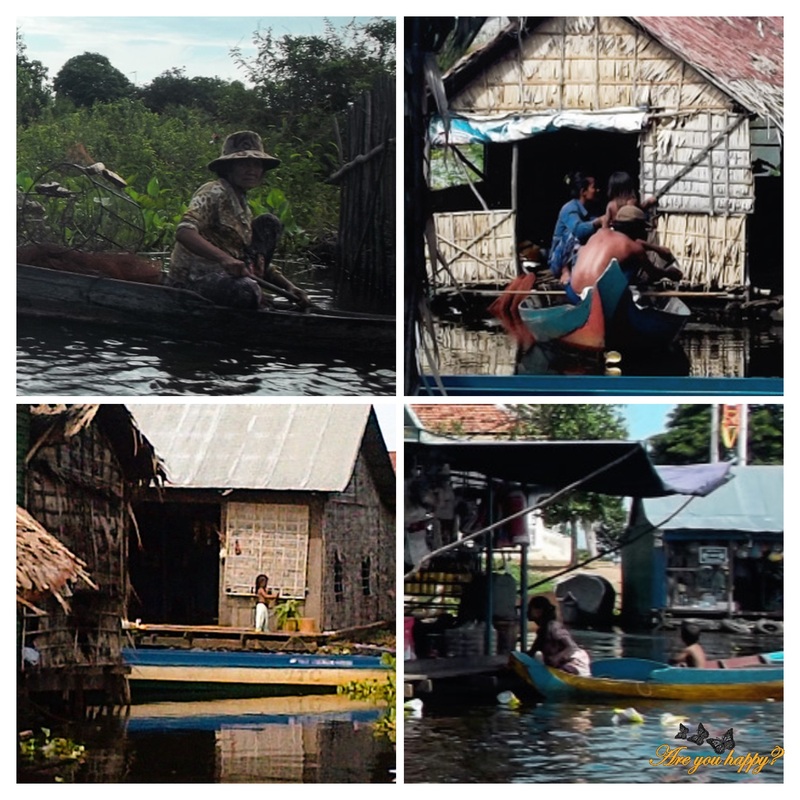 Although some floating houses are connected to electricity most of them have no electricity and use power batteries. You can even find floating platforms to charge batteries. People on the lake usually don’t pay taxes and eat what they can catch or grow. 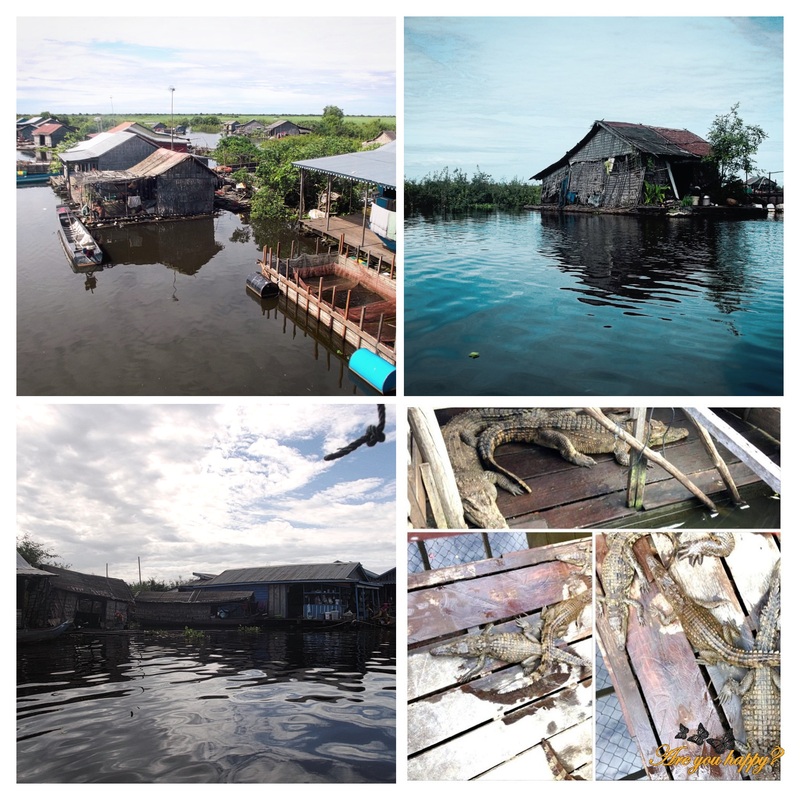 Crocodile and fish industry is developing as the people raise them around the floating houses to make money to survive. Tourist scams are also a way of making money. The water in the lake is used for drinking and cooking as well as for washing or sewage. Bottled water is a luxury. Life expectancy on the lake is short; 54 years or so. 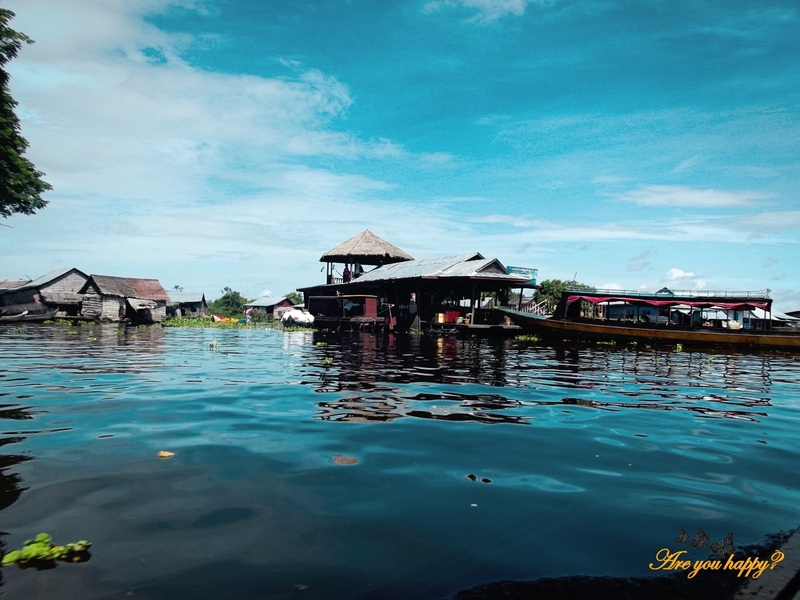 There is no doctor in the floating villages and only very limite medical care. 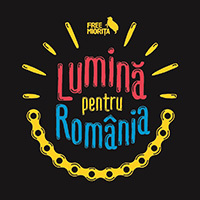 Child birth is high but more than 12% of the children die before the age of 5 and many of them drown afterwards on their way to school when their small row boats capsize. Moving to the city is hard if not close to impossible since this people lack money or even citizenship to allow them to be properly integrated into society. 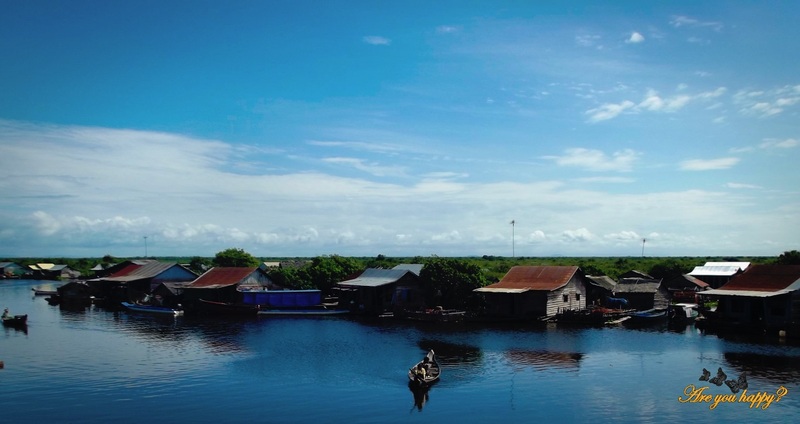 Most of the people in the floating villages are stateless Vietnamese with no papers to account for their names or their origins. 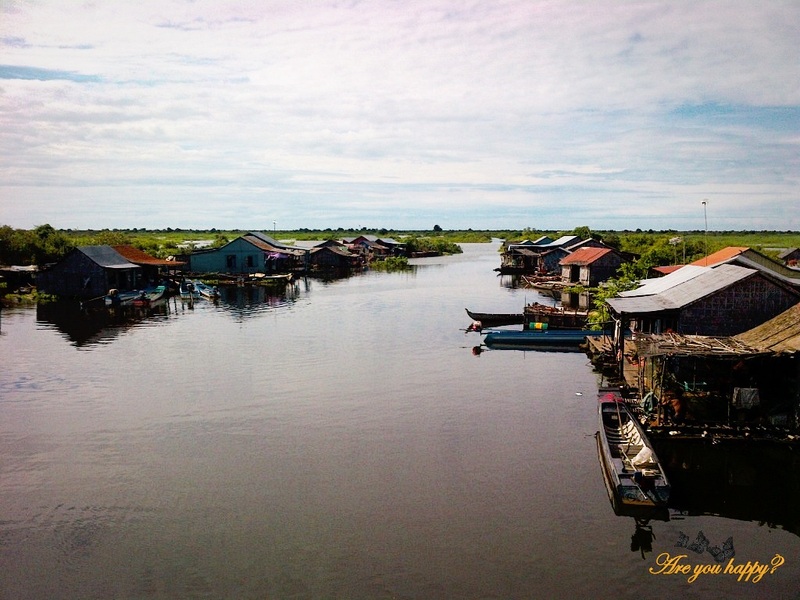 Targets of mass genocide during the Khmer Republic and Khmer Rouge governments like so many other Cambodian people, expelled from the country in the 1970s just to later return to a home that no longer had room for them, the story of the people around the Tonlé Sap Lake is not an easy one. Sitting on the terrace of one of the floating houses tasting for the first time snake soup two small boys approach us to show off with their plastic toy guns. Innocent, playful and full of life just like the kids back home. Just that these ones live on small boat houses, learn how to row a boat before learning how to write, have no drinkable water or medical care, have crocodiles as house pets and are destined to live a nomad life floating on water. As our boat takes us into the sunset to Siem Reap leaving behind the floating villages we carry with us the small happy faces of the two little boys. We repeat in our minds that less is more, we dream of better times for these kids and pray for the lake to keep them safe and their inner happiness to provide shelter in the darkest of the storms. 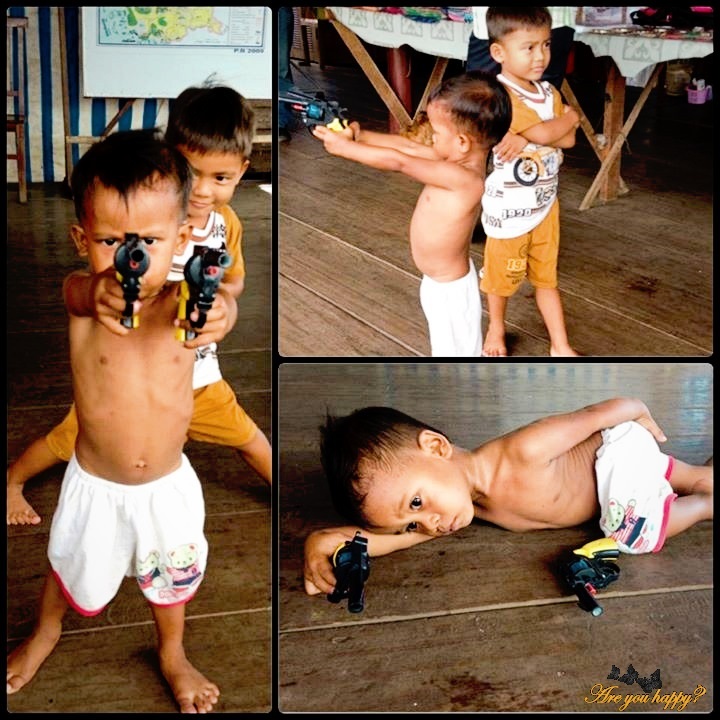 More picture from Cambodia on our Facebook page. More on the history of the Vietnamese Cambodian people in this touching article Hope Floats.